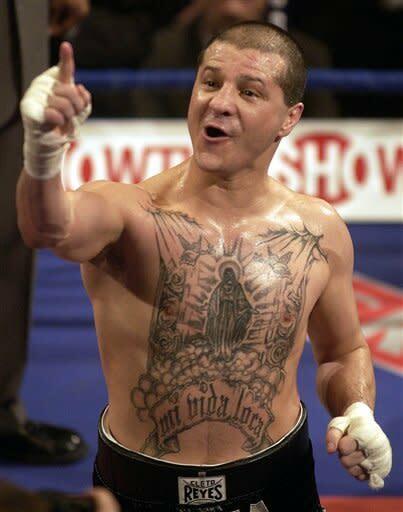 Nobody who knew Johnny Tapia can be remotely surprised that he was found dead inside his Albuquerque, N.M., home on Sunday. The only surprise, perhaps, is that he survived the first four times he was declared dead. Tapia won major world championships in three weight classes and was one of the elite fighters of the late 1990s and early 2000s. Despite his brilliance in the ring, he was far better known for a life story that was far stranger than any fiction novel could ever be. An 89-word passage from his 2010 autobiography, "Mi Vida Loca," probably best sums up the sad life of this small, troubled and talented man. "My name is Johnny Lee Tapia. I was born on Friday the 13th. A Friday in February of 1967. To this day I don't know if that makes me lucky or unlucky. When I was eight I saw my mother murdered. I never knew my father. He was murdered before I was born. I was raised as a pit bull. Raised to fight to the death. Four times I was declared dead. Four times they wanted to pull life support. And many more times I came close to dying." Sadly, on Sunday, he did. A spokesman for the Albuquerque, N.M., police department told Yahoo! Sports a body found in a home in the city's northwest section was believed to be Tapia's. He said circumstances do not appear to be suspicious and that the cause of death will be determined at autopsy. His death was confirmed shortly thereafter. Tapia won world championships at super flyweight, bantamweight and featherweight, relying on guile, cunning and a barely controlled fury. He ripped off punches in rapid-fire manner, as though he was trying to knock out all the demons that were attacking him. In the ring, he stayed calm amid all manner of chaos, keeping his cool as punches flew from all directions at his head and body. He'd duck, step to the side and return fire with remarkable accuracy. It was when the gym doors were closed and the lights were turned off that Tapia couldn't win. Death was his constant companion. His mother was raped, stabbed repeatedly with a screwdriver and chained to the back of a truck. When he tried to tell family members what he saw, no one believed the 8-year-old until it was too late. He saw friends murder and murdered. He ducked bullets more often than he did punches. He went through hell in the ring with a smile because it was a breeze compared to his life outside it. He nearly didn't make it through the second day of his marriage. On his wedding night, his cousins approached his new bride, Teresa, and said to her, "Why don't you go back there and see what you married." Teresa Tapia walked into a bedroom in her new mother-in-law's home and saw her husband of a few hours shooting himself in the arm with a needle. His heart stopped and he was declared dead in her car. He inflicted intense amounts of pain on those he loved with his frequent bouts with drugs and numerous brushes with death, yet he remained a chipper and friendly man who never would simply say hello. If you were a Tapia friend, he'd throw a bear hug on you and squeeze, holding the embrace as if he forever would be safe if he never let go. But the only place in his life where he truly was safe was in a boxing ring. He was 59-5-2 with 30 knockouts in a professional boxing career that covered 23 years, more than half his life. As an amateur, he won more than 100 fights and earned five New Mexico Golden Gloves titles and two national Golden Gloves championships. Tapia never did quit fighting, inside or outside of the ring. He nearly died of a cocaine overdose in 2007, recovered and returned to fight three more times. That he reached 45 was something of a miracle. He always said he expected to be dead long before he turned 40. In his book, he wrote, "My mother was murdered when she was 32. I didn't think I would outlive her. I never thought I'd make it past my own 32nd birthday. I didn't even want to make it past her 32nd birthday. After turning 31, I could feel that time was coming on. It started growing in the back of my mind, and it was always there in my head. I was counting down the days, weeks, and months to the time that I would be the age she was when she died. I started to feel that time was running out for me." Time ran out, finally, on Sunday. He fought to win and he fought to survive. In the ring, he was knocked down just twice, once in his second pro fight in 1988 and then again in his final bout in 2011. He got up both times to win. On Sunday, though, the count reached 10. This was a life he simply couldn't win.